Working with foreign clients is not something much impressive anymore. When 51 % of world population is on the Internet and there are so many tools that support remote work – why should that be still a problem for anyone? Yeah, when we are talking about working with a client who is distant from you by 1 – 3 hours of the time difference – maybe. But how to successfully manage a project when you are working with someone who is almost 10 time zones away from you? When you are visiting a foreign country there are many things that become much tougher to do. Knowing where you are and how to get to the designated area, what are the numbers to the police or nearest hospital and even how to choose the most convenient taxi services – everything becomes a mystery. If you speak English or the language that is used in that country – good for you. You will probably get by with the help of the locals. But what if you don’t understand a word they’re saying? This is where 2Life steps in. The problem that this app solves is a language barrier between Chinese travelers and New Zealand people. 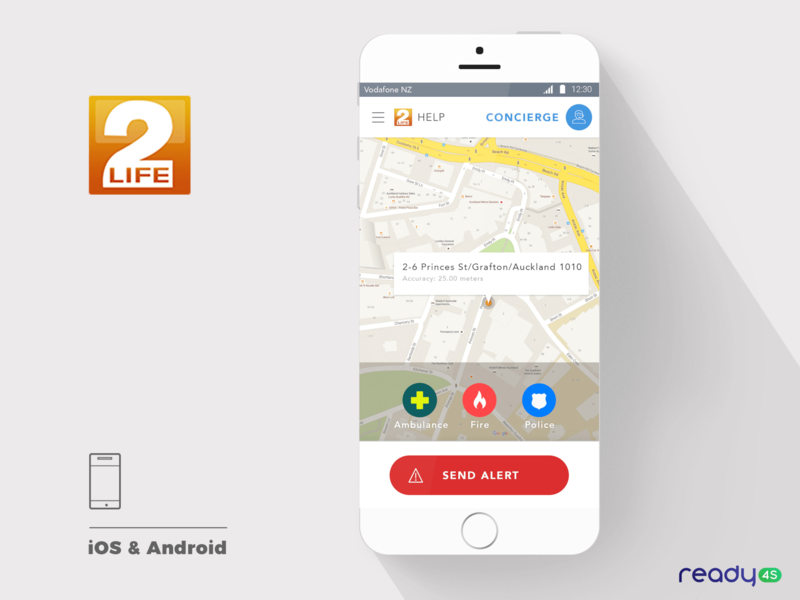 Thanks to 2Life in a case of an emergency, app users are able to contact someone who speaks their language (Mandarin, Cantonian or English) and who will know their location, evaluate their situation and get them the help they need. Services you can order include calling a police, ambulance or even a safe ride home. Besides health & personal safety features, 2Life allows you to order concierge services while you traveling, to make your traveling even more comfortable and stress-free. To do so you are sending a concierge a message, about what you need at the moment and he writes you back with an amount of money you need to pay. You accept that price and that’s it – your service is paid off and will arrive at you soon. The first challenge that we’ve encountered when we started our cooperation with 2Life also eventually appeared to be the biggest one. When we found out, that our client comes from New Zealand – a country, that is distant from us for almost 10 times zones we knew, that we will have to take a very special approach to fulfill his needs. And as a fearless software house as we are – we were excited to take up that challenge! Our job was to make a mobile app (both iOS and Android), landing page, and CMS from scratch. It was a really big project, requiring a lot of work, which would not be easy even if there wasn’t such a huge time zones gap between. The mobile app itself also had to be extremely reliable and easy to use because in a time of emergency – there is no time for scrolling between hundreds of app functionalities. We were working together with 2life designers, development team and software testers to bring up the best product possible. So maintaining a good and fruitful communication was a key factor here – they were all thousands of kilometers away. We accomplished that by adjusting the time of sending emails or making calls to our clients working hours: which meant for us really early mornings or late evenings. It was obvious for us, that we should be the one willing to adapt – not the other way around. Sometimes when you think about outsourcing your project to another country, the first thing that drives you away from that idea is a language barrier. Fortunately – when you’re choosing Poland, you don’t have to deal with that issue. Thanks to the very high level of education, a variety of international companies and the common belief, that knowing English is a basic skill needed to achieve a professional success – our developers didn’t have any problems with understanding exactly what our New Zealand friends expected from us. Bearing in mind, that remaining a full control over a project is a very important thing, we were ALWAYS available to talk – on Skype, emails, WhatsApp or any other form of communication that our client preferred. We were willing to do everything to make sure, that our client will not feel any inconveniences that come from working with a remote team. And we achieved that, thanks to a joint effort of the whole team and a very strong will to succeed. We all were impressed with the collegial attitude they brought to the project. The teams melded well and we believe we achieved a great result. Nationwide Emergency Service: emergency protection wherever there is mobile coverage. Multilingual Operators contacting: Mandarin, Cantonese, and English speaking operators whenever you want, as they are available 24/7 365 days of the year. Easy to use: if ever you need help for whatever reason simply press the icon and you’re linked to our trained call center operators. Real Time Updates: Our solution tracks your location in real time and automatically sends updates to our call center. Smart Alerts: deliver alerts even when there is no credit on your mobile plan. Trained Operators: New Zealand Tourism approved operators. Convenience: Make a request and our expert team does the rest. No Added Cost: You pay just what you’d normally pay if you purchased it from the merchant. Personalized Service: Tell us what you want and our expert operators will find you the best option. Working on 2life was a very challenging thing for us. Not only because of the scale of the project (two platforms + landing page + CMS) but also because of the need of a close cooperation with a team being far far away from us. But we have managed to do that and learned a very valuable lesson: you should never give up on the project, even if you find the biggest obstacles on your way. When there is a will, there’s a way. And even if that way requires you working outside your usual working hours – if this is not a price you are willing to pay, maybe working with international clients isn’t a thing for you. But remember that victory coming easily doesn’t taste as good as the one occupied with sacrifices. And we can assure you, that our 2Life project success tasted truly amazing.